Two award-winning Sherri Duskey Rinker classics now available as a baby board book boxed set: Even the roughest, toughest readers will want to turn off their engines and snuggle up with these sweet and soothing bedtime stories. Gentle rhyming text and vibrant art make these books surefire bedtime favorites for train- and construction-crazy kids everywhere. 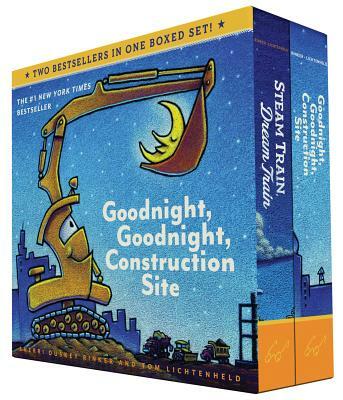 A gift that will delight: If you and your child liked toddler books such as Goodnight Moon, Dragons Love Tacos, The Day the Crayons Quit, Giraffes Can't Dance or Llama Llama Red Pajama; you'll love the construction board book boxed set Goodnight, Goodnight, Construction Site and Steam Train, Dream Train. Sherri Duskey Rinker lives in Chicago with her photographer husband and two energetic, inquisitive sons: one fascinated by bugs and magic, and the other by trucks and trains. She created these goodnight stories in hopes of happier bedtimes and sweet dreams for all. Tom Lichtenheld loves drawing pictures and telling silly stories. His books include the New York Times bestseller Duck! Rabbit!, Wumbers, and the ALA Notable Children's Book E-mergency! He lives in Geneva, Illinois.